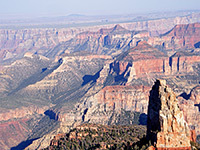 At 8,803 feet, Point Imperial is the highest of the North Rim overlooks, and the northernmost, presenting a rather different panorama than that from the other two popular viewing locations further south (Cape Royal and Bright Angel Point). Imperial sits high above the region where the Grand Canyon first takes on its characteristic wide, branched appearance, since just to the north, the cliffs either side of the Colorado are relatively close (a mile or less), and from here 50 river miles north to the official start of the canyon at Lees Ferry, the gorge is mostly unbranched and more conventional in dimensions. Imperial is linked to the Cape Royal highway by a bendy side road, which climbs the narrow, partly wooded valley of upper Bright Angel Creek, past a few meadows and open grassy hillsides, ending after 2.6 miles at a circular parking area beside the point. A fire track (open to hiking only) continues a few miles further north along the rim to an intersection with Kaibab National Forest road FR 610 and the Nankoweap Trail. Much of the surrounding pine forest has been quite badly burnt in recent wildfires, allowing new groves of aspen to spring up. From the Imperial Point carpark, a very short trail descends a little to the flat rocks of the overlook, protected by railings because the land falls away vertically on three sides. 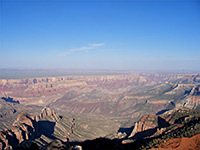 The views are extensive and varied, encompassing the Echo & Vermilion Cliffs, the upper Colorado canyon (Marble Gorge), the dead flat, treeless plateau east of the river, and a large area of buttes and cliffs downstream to the south. This is a good location for watching a Grand Canyon sunset, owing to the amount of tributary ravines visible, and the high elevation. Of the many named topographic features in view, most prominent to the north is Boundary Ridge and its central peak Saddle Mountain - the ridge forms a divide between the flatter, desert land further north and the uneven cliff, canyon & mesa country to the south. The Nankoweap Trail runs across the lower slopes of the ridge, on its 14 mile, 6,000 foot descent to the river. Below the escarpment, the first multi-branched side canyon is that of Nankoweap Creek, the upper end of which is enclosed between various ridges and spires, including Mount Hayden, Hancock Butte and Alsap Butte.